Part of the Intel Security Group, and founded in 1987, McAfee is one of the earliest providers of internet security. Its leading product, McAfee LiveSafe, is one all-inclusive security suite that provides its users with complete protection on all of their laptops, desktop computers, tablets, and smartphones. One license of LiveSafe will cover an unlimited number of devices that the user owns, making it especially convenient for users with multiple computers and devices that need protecting. McAfee has the following plans for users to choose from. Premium antivirus, identity and privacy protection for your PCs, Macs, smartphones, and tablets – all in one subscription. All the plans have a 100% guarantee, meaning all viruses will be removed from your devices or your money back, according to their terms and conditions. McAffee LiveSafe is easily installed on Win 7/8/10/XP/Vista, Mac, Android, and iOS, and works in the background, updating automatically when needed and scanning for potential threats online and already installed on your computer. When you install new software or download new files, McAfee will automatically scan them and block them if they contain any malware. What makes McAfee LiveSafe unique is its “Real-Time 11Scanning” feature which scans files already installed on your computer. As soon as you or your device access a file, McAfee LiveSafe will scan it to ensure maximum security. Operating systems and various apps access files on an ongoing basis without your knowledge, allowing McAfee LiveSafe to spot threats that may be “hiding” in the background attempting to steal your personal data. McAfee LiveSafe has a number of features that protect your files and personal information when using the internet. Firewall – A firewall is set in place to protect your computer against hackers by monitoring all of the information received and sent by your device. Spam Filter – The “Anti-Spam” function filters junk mail in your email and blocks any possible phishing attacks. Site Advisor – This features provides you with information on websites before you visit them, informing you of which sites are safe and which aren’t. Shredder – The “Shredder” permanently deletes files that contain sensitive information. The user chooses which files to delete in the user interface, including files in the Recycle Bin, Temporary Internet Files, and in any custom folder on their device. Vulnerability Scanner – Installing software updates and patches released by your operating system and the apps you use is very important to ensure no security breaches are left open. LiveSafe searches and installs the latest software updates for your operating system and apps automatically. The “QuickClean” feature scans your device for any unnecessary and outdated files and allows you to remove them to improve your device’s performance. McAfee LiveSafe includes many additional features, from Parental Control to a “Threat Map” which allows you to view active threats in your region and around the world. Once installed, McAfee LiveSafe is already configured to provide you with complete protection. Additional features which need your input, like Parental Control, are easy to understand and manage and don’t require any technical knowledge. The default view of the user interface provides you with clear information on the last scan, the status of your current subscription plan, whether your software is updated or not, web and email protection, and virus and spyware protection. Two additional menus are available on the right side. The first includes Data Protection, PC and Home Network Tools, and Parental Controls, and the second is a navigation menu showing you all of the features in one place and a help button for support. While some of the more advanced features may seem complicated, LiveSafe provides complete security from the moment it is installed without any required intervention on the user’s side. McAfee AV has comprehensive customer support. They have a virtual assistance that guides you through any technical trouble you are having. There’s also 24/7 phone and live chat support which you can call or chat to get 1-on-1 assistance. Nevertheless, you can still reach the support agents through email assistance, or browse the knowledge base, FAQs, and video tutorials for solutions. For more information, there’s a community forum and a blog on the website. Standard support is available Monday - Friday, 9:00am-6:00pm. Premium Support is available 24/7. Email is available for registred users only. There are video product guides available. The blog has articles, news, and insights. 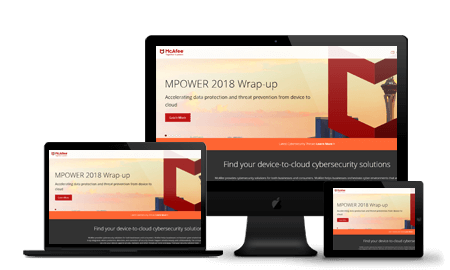 McAfee is a great solution for anyone with more than one device and protects users against malicious attacks and identity theft on all fronts, including email and social networks. The user interface is friendly and convenient, and once installed, protects the device efficiently and silently without compromising its performance. McAfee offers a number of different security packages. Click the button below and find the one that best suits your needs.